Luxury 4-BR, Just 1 Mile to Beaches, Ski, Casinos! 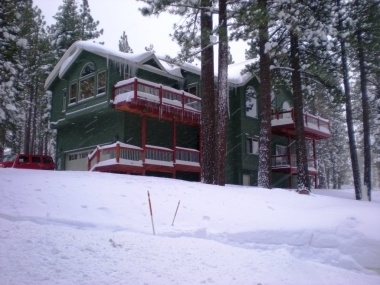 Unbelievable Vacation Rental located only 1 mile to Heavenly Ski Resort, 24 hour casinos, and beautiful Lake Tahoe Beaches! This one-of-a-kind home has been customized to be a rental with every attention to detail. You will find a 50' TV with stereo surround sound in downstairs family/movie room. A 42' TV in living room with a wonderful gas burning fireplace. The open great room is perfect for entertaining with 2 decks, a huge kitchen with a breakfast bar and granite countertops, and beautiful, custom artwork throughout. The Master bedroom is upstairs with a 32' flat screen TV/DVD and a gas burning fireplace. The fireplace is two sided and leads into the master bathroom with a jacuzzi bath tub. Bedroom 2 is 2 bunk beds, one with single beds and the other with a queen on the bottom and single on top. The entire home is surrounded by 3 acres of forest/conservancy land so you will have complete privacy. Not to mention a brand new hot tub on the back patio with no neighbors in sight! 4 decks and 6 flat screen TV's complete this home. Take the opportunity to book this spectacular home and you will not be dissapointed! Please note: This home does require a 3 night minimum throughout the winter. Please call our reservation agents to check availability. There is a sofa bed available for two guests.